I rarely mix my recipe blogging with parenting, but today I’m feeling inspired to tell my story about raising a son with autism. It’s something my family and close friends know about me, but rarely anyone else. I’ve never publicized this information because I wanted to protect my son and family from any repercussions and stay private.I’m not ashamed or anything about our situation, but it is a sensitive subject especially when things aren’t going well. Lately, Andrew the son I’m speaking of is struggling with college. Although I am proud that he has come this far, I’m worried about his chances of graduating. Here is a little glimpse of his story. Andrew is currently 23 years old and one of the sweetest men you will ever meet. He is well spoken, articulate and handsome. He is athletic in the sense that he has earned his third degree black belt in Taekwondo and had been teaching students at a local studio for the last five years or so. Andrew also achieved his Eagle in scouting when he was in high school. He worked hard to gain this honor by learning leadership, completing many badges, hiking for days in the wilderness, and completing a project that helped the Monument Crisis Center in Concord. He is also a very talented musician. Andrew’s choice of instrument is his voice. He is a tenor and received much of his training from director Ken Abrams and the award winning San Ramon Valley High School and was lucky enough to travel to Costa Rica. My husband and I were chaperons for most of his tours and enjoyed supporting the organization. 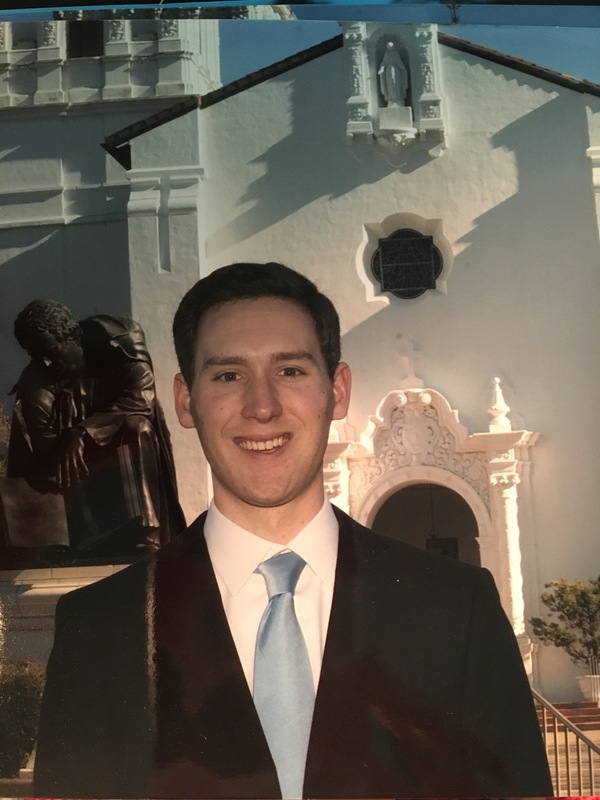 Andrew got a partial scholarship to go to college at St. Mary’s College of Moraga California and joined the Chamber Singers Choir with the famous Dr Julie Ford. In the past year they performed at Carnegie Hall and in Latvia the summer before. St.Mary’s Choir is traveling to Russia this Spring to compete in the World Choir Games and our son is hoping to rejoin the choir next semester and perform with them. 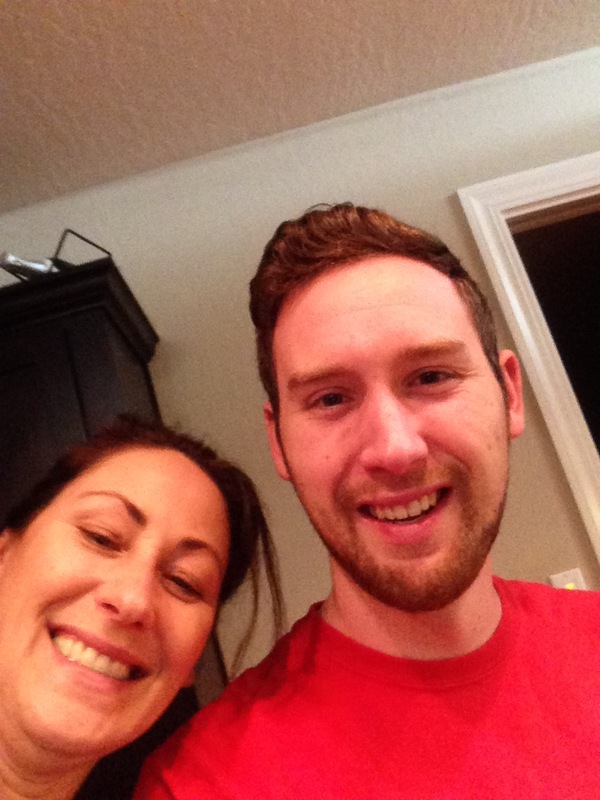 At a the young age of 7 we sought out piano lessons for him and he continued his studies in music for ten years. As of last summer, Andrew taught piano and voice lessons to students in the East Bay area and hopes to continue to share his passion for music in the future. But even after all this success, our son seems lost. He had to cut back his school schedule because of finances and is currently a part time student at St Mary’s College and Diablo Valley College. He chose not to sing this semester and I believe it was the worst decision of his life. He is now more quiet and withdrawn than ever. He goes to school, comes home and goes directly to his room. Most of his college friends have graduated and moved on. He doesn’t have the social life like he did since he now lives at home instead of on campus. As you can see, Andrew has had tons of success in his life. He has so much potential to be a great musician, composer or teacher someday, yet something is getting in his way. As a parent, it is hard to know how involved I should be. When he was young, it was easy. It was my job to make sure he got the best teachers, disability counselors, etc. Now things aren’t as clear. I realize I’m not the only mom raising a son with disabilities. And I know there are many kids/adults with autism that haven’t had these successes or opportunities like my son has had. Being a parent is hard. I have to trust that Andrew knows whats best for him. I have to believe that one day he will overcome these struggles. I don’t know what it is like to be him. I haven’t walked in his shoes. I’m only the mom who cares for him and loves him and wants the best for him. This is what I know. I know I will be there for him through the good times and the bad. I will support him and his decisions while he is learning the ways of the world. I’m grateful for being given the chance to raise a son with autism. He is going to do big things and go places someday. I am confident I can look at the big picture, take a step back and be happy with my parenting so far. Here are two recipes that I have made recently that my family loves. You will never go back to making a plain cornbread ever again. Toss in some blueberries and see how these warm berries burst in your mouth. Adding a pad of butter to the warm slice always brings a smile to Andrew’s face. 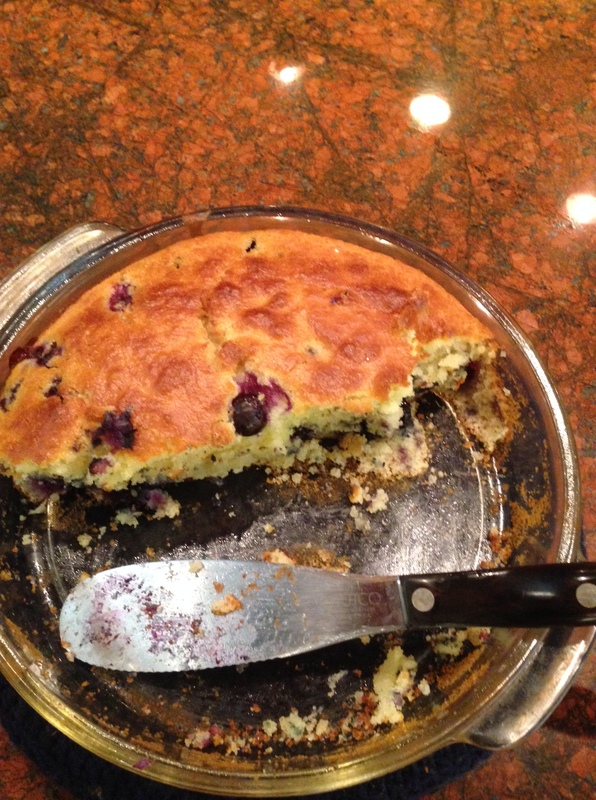 Here is the best Blueberry Corn Bread recipe. Preheat oven to 350degrees. Butter or grease 9” round pan. In a large bowl combine flour, sugar, cornmeal, salt, and baking powder. In another medium size bowl combine milk, eggs, oil, and melted butter and mix well. Pour wet ingredients into dry ingredients and stir with a wire whisk until blended. Toss blueberries in last and stir. Pour into a round baking dish and place in center of preheated oven. Bake for 30-35 min or until tooth pick comes out clean. Need a healthy alternative to either a plain bowl of cereal or a hard boiled egg for breakfast? 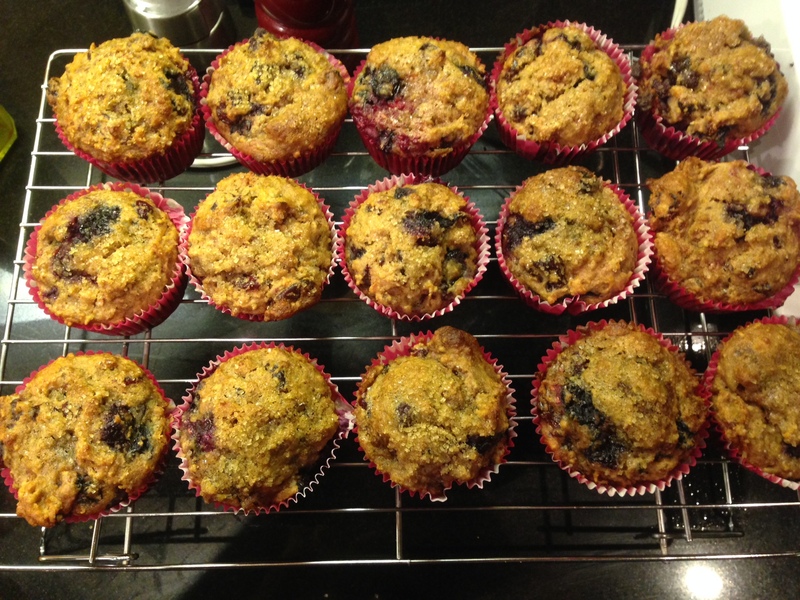 Try these delicious moist muffins. They freeze well and delight even the pickiest eater. If you like them extra sweet, top with a cream cheese frosting for a little extra tangy flavor. 24 Dried Apricot halves, chopped (Soak in ½ C Brandy) Heat Brandy in microwave first. Add apricots and let them get plump before removing from liquid and chopping. 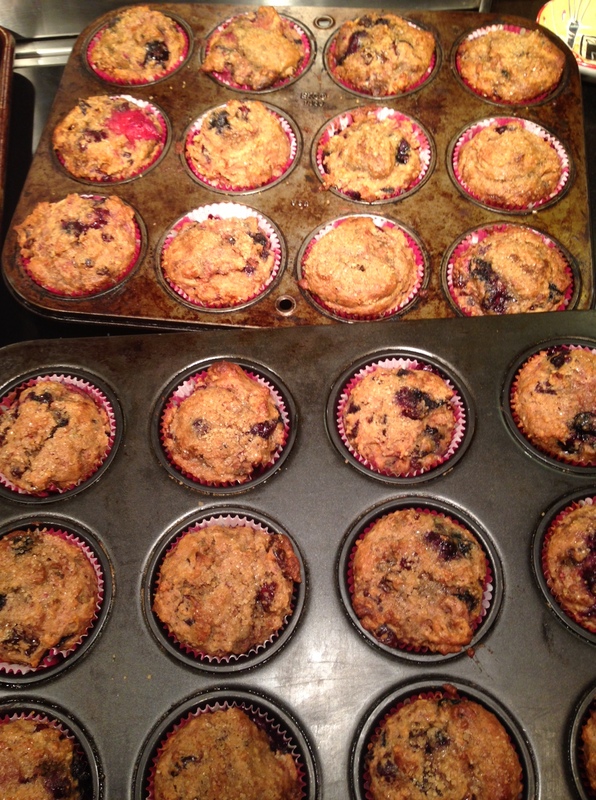 Directions: Preheat oven to 400 degrees F. Use Paper liners and line 2 muffin tins to bake 24 muffins. Combine flour, sugar, baking powder, soda, salt and spices. In a large bowl combine oil, yogurt, orange juice, and eggs. Mix well. Add dry ingredients ½ cup at a time just until combined. Gently stir in blueberries, cranberries and soaked apricots. Spoon batter equally into muffin tins. Bake until tooth pick comes clean when removed about 15-20 minutes. Cream cheese frosting: 8 oz room temperature cream cheese, 1/2 C softened butter, 1 1/2 C confectioners sugar, 1 t vanilla. Mix until combined. If you like this blog please follow me. If you have any questions about the recipe please leave a comment below. I’d love to hear from you. Feel free to share on social media to your family and friends.